[pot'-latch] or [pät-lach] — noun, verb. Meaning: Gift, to give, to receive. Origin: Nuu-chah-nulth, patlach "to give in ceremony", “to make a ceremonial gift”. The potlatch was the ceremonial distribution of property and gifts practiced among the First Nations of Cascadia along the Pacific coast, particularly the Kwakiutl, and were an institutional foundation of coastal society and economics. They were typically held by an heir or successor to assert and validate their newly assumed social position. Ceremonial formalities were observed in inviting guests, in speech making, and in distributing goods according to the social rank of the recipients. Opulent ceremonial feast and generous hospitality accompany the potlatch, marked by the host's lavish distribution of gifts or sometimes destruction of property to demonstrate wealth and generosity with the expectation of eventual reciprocation. Since the chief who held the largest potlatch and gave away the most valuable and largest number of presents gained more honor and social standing, this led to inevitable one-upmanship among local leaders. This form of competitive altruism has been much studied by anthropologists for the light it sheds on the nature of property, wealth, prestige, and social status. 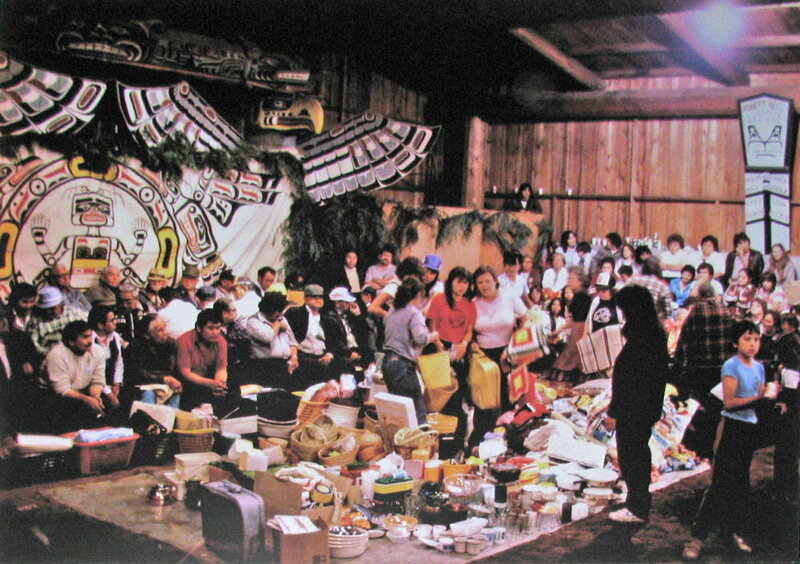 Gifts being distributed to guests at a potlatch given by Tlakwagila (W.T. Cranmer). Alert Bay, 1983. Modern usage outside of the First Nations generally refers to a communal meal where guests bring dishes to share, a potluck. As a noun, a Potlatch can mean a social event or celebration, or can refer to a gift, especially with the expectation of a gift in return. As a verb, it can mean "to give" or sometimes "to receive" (as a gift), though "iskum" is usually used for the later. As a verb, “potlatch” implies the act of giving. "Potlatch muckamuck" ( to give food) and "Potlatch dolla" (to pay) are simple examples, as are "potlatch wawa" (to make a speech), "potlatch kloshe wawa" (give good talk, to congratulate, or to give good advice). In round about ways it could even be used to describe social concepts, such as "potlatch kopa saghalie tyee" (consecrate) and "kloshe mika potlatch nika wawa kopa yaka" (to intercede). As a noun, when not referring to the ceremony itself, “potlatch” was a generic meaning for a gift of some kind. “Mamook potlatch” means ‘to make a gift (of something)’, while a "cultus potlatch" (worthless gift) was seen as a token gift without prospect of recompense, whether real or insisted upon by a humble gift-giver.